For its annual visit in 2015, the Society of the Sacred Heart of Jesus dedicated a lot of time to plan. The preparation itself appeared to be quite expensive, since we were scheduled to visit two cities at once. However, since the visit involved the honor of Our Lord in this land, we spared no expense. And why would we settle for the less? After all, one day or another, all of us will bear responsibility for how we have served the God in our life. On the first weekend we visited Tver, and on the second weekend arrived in Perm in the Ural Mountains. As in our previous journeys, our Society was led by Father Thomas Huber (of Augsburg, Germany). Before we were even able to leave to Tver, we had to pay three extra visits to Moscow. Rehearsals with local servers and the organ player, as well as conversations with Fr. Marek Takhikovskiy were also quite time-consuming. Finally, we managed to settle down all significant organizational issues, so that the Society of the Sacred Heart of Jesus finally could proceed on its scheduled annual visit on June 20th, 2015. In order to travel from Moscow to Tver we used Inter-City Express Train. After around an hour of travel, we arrived in Tver, located 170 km North-West from Moscow. Although, usually we try to arrange 3 Masses on weekend in the community we visit, we only managed to celebrate only 2 Masses there, because of the local Pastor’s busy schedule. Well, that’s at least, something. Unfortunately, it is not certain, how many Catholic parishioners actually reside within the territory of Tver. Father Marek, who has been guiding the community since 2008, managed to count around 100 parishioners on 4 Sunday Masses (including Mass on Saturday and 3 Masses on Sunday). After the Revolution in 1918, almost all priests disappeared. The Church was closed and devastated at the end of 1920s. Among other valuables, the community archive, library and organ were also stolen. After the fall of the Communist regime, the Church was restored to its use in the 1990s. At first, the Masses were offered at the wooden cabin, while the modern building of the Church was under construction. The new Church was solemnly dedicated by Archbishop Tadeush Kondruzevich on February 2nd, 2003. We started our Saturday service with a Requiem Mass. Father Thomas Huber offered a daily Mass for all the dead, including the deceased members of Tver community. As in our annual visit to Berezniki in 2013, we were supported and encouraged by Ms. Olga Alekseyeva and her beautiful performance of the Requiem and Dies Irae (The Day of Wrath), in particular. The musical parts of the Mass (“Lord, Have Mercy on Us!”, “Sanctae”, “Agnus Dei”) were conducted and sung by Irina Poruchikova, community organ player. The altar servers were Gregor Huber, Chairman of the Management Board of the Society of the Sacred Heart of Jesus, and Nikita Evstratov, acolyte of the Tver Parish of the Transfiguration. During this annual visit, we managed to present and give out for free, the fully revised and amended fourth edition of Ordo Missæ to the local believers. Ordo Missæ is a brochure that contains the prayer parts of Holy Mass in both the Latin and Russian languages. Along with regular materials, such as Litany to The Most Sacred Heart of Jesus and the Prayer of our Society, we were happy to first present the “FAQ”-- with the ten most frequently asked questions regarding the Traditional Mass. All these materials – as it often happens – were well received by the believers. Here we would like to express our sincere gratitude to our benefactors throughout the world, who gave us the opportunity to provide these materials for free. At all the Masses arranged by the Society of the Sacred Heart of Jesus, we offered our sincere prayers for the souls and salvation of all our benefactors! It is worth mentioning that the Society of the Sacred Heart of Jesus has arranged and celebrated more Traditional Latin Masses in the Post-Soviet era than any other group of laypeople and ministers of the territory. 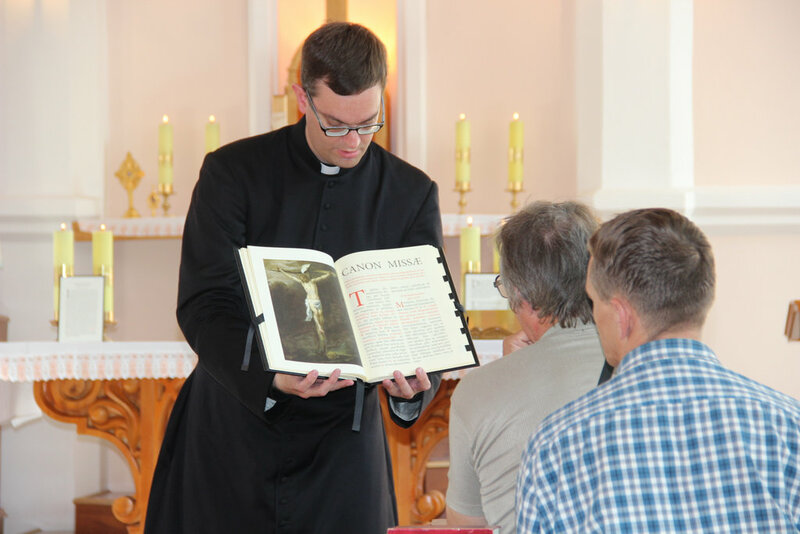 Around 15 believers stayed to witness the Requiem, after a Novus Ordo Mass was celebrated by the local Pastor. Although not many, there are already enough to require celebration of the Extraordinary Form of Mass from time to time by the parish priest. According to the 1962 Catholic Calendar, the day was the Fourth Sunday after Pentecost. Before the Mass started, the parishioners could witness the beautiful performance of Asperges Me and the aspersion of holy water by the priest, which usually takes place only on Sundays. Aspersion can also take place during the Novus Ordo Mass, however this leads to omission of the very important short Confiteor. For the Mass, the Missa de Angelis and 3rd Apostles' Greed were chosen for the music, in the hope that a few parishioners probably would sing alone or at least relatively understand or remember the Liturgy. This particular Mass is the most well-known in the Old Rite. Acolytes Gregor Huber and Nikita Evstratov were assigned with special mission: to serve during the solemn Mass and simultaneously apply incense with two other servers. After all, the celebration of Holy Mass shouldn’t be affected by the fact that only one local minister appeared at the Church on Sunday! After the Mass we had a pleasure to meet a young lady, Irina Sergeyevna Banduris, who welcomed the Society of the Sacred Heart of Jesus with the words: “Finally you have come!” Of course, we were happy to hear such warm welcoming words and appreciation. In our further conversations, we found out that the representative of Una Voce Russland in Tver had been trying to arrange the Mass in Tver for several years. After the Masses in Tver, we returned to Moscow again. We did it because we had to derive some strength and pick up fresh portion of materials (Ordo Missæ in particular) for our next mission. Between June 25th and 28th we visited the Catholic Community of the Immaculate Conception in Perm. Since September 2010, the community is led by Father Dmitry Novozeletskiy, who had also worked at Liturgical Commission in the Archdiocese of Moscow. In order to be able to prepare everything for the Masses on Friday, we decided to arrive on Thurthday. After two hours of flight, we landed at the Perm Airport (1400 km East of Moscow). We already knew this place from our Berezniki visit in 2013. Yes, our first visit here was 2 years ago in 2013 was part of our annual journey. In fact, in 2013 the Society already managed to connect with the Perm community, when we visited Berezniki, located only in 3 hours by bus from Perm. Unfortunately, in 2015 we couldn’t come in contact with Perm community directly. However, we didn’t want to abandon the Perm community, which, of course, already had heard about Masses celebrated in close proximity, and had tried to contact us in order to have Masses offered in their hometown. That’s why we decided to give these thirsty souls an opportunity to participate in the Extraordinary Form of the Mass--at any cost! As always, Mr. Gregor Huber went to Perm with preparatory visit, despite all the financial costs of such flights. This is the procedure we usually utilize in our activities: if the Pastor cannot arrange the preparatory visit, or fails to arrange the principal issues on-site, the Society cannot visit such a city as part of the annual journey. Well, if that happens, then one can surely say that neither our Lord, nor Jesus Christ rule in such community. Currently, the Perm community consists of 300 believers, 120-140 of which are proactive in the Faith. The Catholic presence locality had come between 1875 and 1937. The last Old Mass said here was served by the Father Philipp Budris, who together with his 40 parishioners, was executed by communist troops not far from Ufa. The church that survived the communist reign was re-opened on October 17th, 1993. According to Liturgical Calendar, that Friday was the Day of Saints John and Paul (canonicalized saints). Gregor Huber and local acolyte Yevgeniy Ashlapov were ministers during the Mass. It is impossible not to mention the neat and tidiness of the sacristy. “I’ve never seen anything like that in Russia”, said Gregor Huber, deeply surprised. Upon arrival, Sister Petra Krishtofikova, SCSC handed over to Fr. Thomas Huber the gold and the silver chalice duly furnished and suitable for sacred service for the Mass. The Sisters also presented to Father Huber a Missale Romanum published before 1962. It was something really unexpected, as we already gotten accustomed to “bringing the whole sacristy”, including the altar accompaniments, two tone-aligned altar bells (even the Moscow Cathedral doesn‘t have it) and Missale Romanum. And now, here in Perm, in the midst of Ural Mountains separating Russia’s Asian and European parts, at the gates of boundless Siberia, the the real genuine Missale Romanum smiled at all--waiting to be taken and used for the Holy Mass of Ages. These are the moments of true happiness, when we find such traces of true Catholic Faith in Russia. The SCSC Sisters (Congregatio a Sancta Cruce) accorded a gracious welcome to the Society. Even at the preparatory meeting, Gregor Huber was already invited for a dinner by the Sisters! On Saturday, Father Dmitry, Chaplain Thomas, Sister Philippa, Gregor Huber and chanter Mikhail Fedeneev visited the open-air museum Khokhlovka, whose collection includes the wooden building known throughout Russia for its unique architecture. It was a pleasant diversion, thanks to the fresh crispy air and beautiful landscape reminding one of Baden Schwartzwald, the homeland of Gregor Huber, who didn’t have many recent opportunities to visit his motherland. The preparation for Mass started at the Church well in advance, with practices with the various ministers and chanters. It was a great opportunity to celebrate a Requiem Mass (Missa Cotidiana), which the Society of the Sacred Head of Jesus didn’t want to miss in Perm. Gregor Huber and local acolyte Stefan Savelli were ministers during the service. Olga Alekseyeva also arrived to Perm in order to support the Society of the Sacred Heart of Jesus’s work with her beautiful singing. May God bless you all! On the fifth Sunday after Pentecost, the Society celebrated the final Mass of these three days and of our annual visit, as a whole. Most befitting, the Mass started with Asperges Me. The local servers, Yevgeniy Ashlapov and Stefan Savelli. gladly agreed to participate in this part of the Mass. “By the end of these three days and, in particular, after the solemn Mass on Sunday, I could witness two very tired, but happy faces of our altar servers”, Gregor Huber recollected of his colleagues, who managed to master so many new aspects of theology and altar serving. During all these 3 days, the community’s chanter Mikhail Fedeneev, performed all the chants and hymns during the service. On Sunday, Anna Fekhtomova also sung the hymns. Community organ player Irina Karazeva gladly and professionally accompanied the Mass with organ music. We are really happy to realize that together we can overcome all the challenges and perform our mission reverently! From the very beginning, the ‘innovative’ approach predominated in relation to the Church music. This is something that you cannot see every day. The Society of the Sacred Heart of Jesus expresses its sincere gratitude to Father Dmitry Novozeletskiy for his trust and hospitality, and we offer our prayers to God to bless the whole Perm community. Dear friends, believers and donators of Extraordinary Masses in Russia! This annual 2015 visit of the Society of the Sacred Heart of Jesus covered six Catholic communities all over the Russia, where the Society arranged the reverent offering of the Traditional Latin Mass. We would not manage to do this without your diverse and valuable support. We have seen many graces God has sent on us. Since the establishment of Society in 2010, we celebrated hundreds of Masses, including in Moscow. Hundreds of Catholic believers and just people have become interested in attending these Masses. We have benefit from kneeling down for so many Eucharistic Rites, where the Host is put into the mouth of communicant. And this is only on one part. On the other hand, a local priest in Moscow once asked me why the Society of the Sacred Heart of Jesus is ready to pay such a large expenses just to arrange these Masses. By asking me such a question focused merely on money, he showed perfectly how he misses the point. The Extraordinary Mass is a pure transmission, the absolute blessing and the most beautiful thing man can do on this Earth. Unfortunately, the attitude of that clergyman is not an isolated case in the Modern Catholic Church. In the end, this same priest separated himself from the Faith. We have to pray for the soul of such clergy. I thank all of you, who make and wish to make it possible for us to do our work, with my deepest gratitude for your prayers and donations. After more than 12 years of living and working in Russia, I know well that everything could go wrong very fast. The arrangements made and confirmed, might be cancelled at the last minute. The people may connive and deceive without a trace of shame. I got used to it on my job. The things like that should not exist within the Church, but, unfortunately, even here, it is sometimes not much better than our godless, secular world. But when facing such situations, many times I felt the power of your prayers and the sacrifices you offered for this annual visit in 2015. And you can be sure that when the Mass was offered in the different cities of Russia, all your contributions were dedicated and sacrificed for it. The annual 2015 visit is long over, and already we look at it as the thing of the past. But still, some still partially “feel it”, and this is the reason why I address to you, my dear friends, believers and benefactors of Catholic tradition in Russia, with this message today. However, with the end of annual visit of 2015, we started the new preparations for 2016 visit to other corners of Russia. And already today, I dare to ask you for your generous donations and your sincere prayer for this sacred mission. This work is a continuation of Catholic tradition that existed in Russia before 1969. This work undertaken with the patronage of Most Sacred Heard of Jesus is done for transformation of Catholic Church, mutual understanding between the nations, and establishment of the Kingdom of Heaven on Earth.